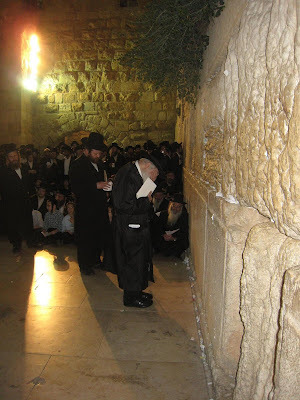 Great pictures showing the Erloi Rebbe praying a "Tikkun Chazzot - Soul rectification at Midnight" at the Kotel (Western Wall). The special prayer took also place due to the Shabbat opening of the municipality praking lot "Karta". 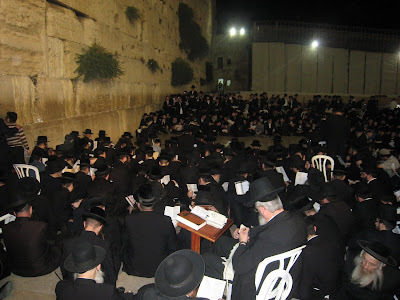 See the haredi "Yahadut HaTorah" politician Me'ir Porush sitting in the front row to the right. I found different spelling versions on the Internet and finally changed in into ERLOI, as someone told me ORLOI sounds like foreskin. Well, I didn't mean foreskin but a chassidic group. i would think that you would have the easiest time of figuring it out as it is named after a German town in Hungary, "Erlau." (called Eger in Magyar). They are not really "chasidic" in the true sense, rather are nusach ashkenaz Oberlanders who followed the Imrei Sofer (Chasam Sofer's einekel). Erloi is the same as Krula, correct? 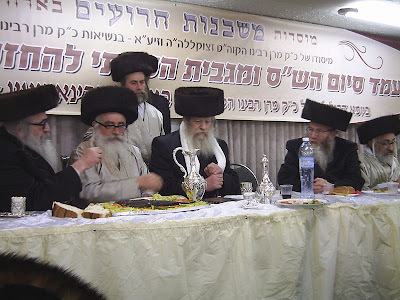 I was going to see the Krula Rebbe in Boro Park until I found out that Krula is associated with Spinka, and after the Spinka Rebbe's recent arrest I didn't want to have anything to do with that group. Krula has a connection to Spinka but if they are connected to Erloi, I don't know. How is the arrested Spinka Rebbe ? Do you know what is going on with his case today, as there is nothing in the press anymore. Well, Orloi to me sounds great. Or Eger and Erlau. I have been planning to write about them a lot, as I know one of the Chassidim who is very close to the Rebbe and a kind of finance minister in Erloi. Yes, I have heard about that but they do wear Streimels on Shabbat. The men wear long black coats and the women wigs (I don't know if they shave off their hair as well). I don't know if the boys only study in their Mosdot but they do study in Yiddish. The girls mostly go to an ordinary "Beit Yaakov" where they study in Hebrew. I was invited to the Katamon Synagogue (Beit Midrash) many times and finally I should make a move and go. They do not strive for higher studies and do not study Talmud. At least not the ones in Jerusalem. What I find interesting is that they come from the Chatam Sofer but do vote for the Knesset party "Yahadut HaTorah" ! Yes, Krularebbe.com is where I found him, and I believe it says there that another name for the group is Erloi. The Spinka Rebbe was just in the news actually. He received a five year jail sentence. Don't know if it's being appealed. I must have a look again at the webiste, as I didn't see anything at first sight. What is going on in the States ? The Spinka Rebbe got arrested and now it is the Syrian community being in trouble. Money laundering and I don't know what. This comes together with the "Mea Shearim Mother Scandal" and what a kind of impression do people get from religious Jews now ? No matter if the accusations are true or not. So far, I haven't really dealt with the arrests in New Jersey, as I am not into the "Chalawi" clan issue. There are two different groups of Krula under two different rebbes. The ones in Williamsburg are connected to Spinka. However, the Krula Rebbe in Boro Park is not connected to Spinka. I was told that after the war, the father of the current rebbe in Boro Park went to Bnei Brak to rebuild Krula, and then to Boro Park at the behest of the Satmar Rebbe. 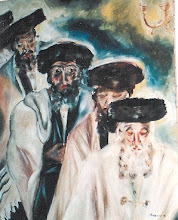 The Krula (Spinka) of Williamsburg became ruv of the town's surviving Jews after the war, then soon moved to Williamsburg, so the two developed differently. Do we have to stink these Days ? Is Hillary that BIG ? Is this a Mea Shearim Clothing Style ? Where are the good old primitive Blogging Days ?